On the left map, we grouped Guide Fishing Reports that are located close to each other into small circles. Now, you can locate all Guide Fishing Reports on the map at the same time. You can also drag & zoom the map. 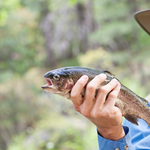 Circle numbers - Count of Guide Fishing Reports that are located in and around that circle. 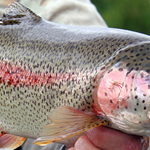 Colored circles - Guide Fishing Reports that are displayed in the list below. Grey circles - Guide Fishing Reports that are displayed on next page(s). Half colored circles - Some Guide Fishing Reports in that circle appear in the list below and some on next page(s). Click on circles to zoom in or highlight Guide Fishing Reports . The spawning rainbow thing is going off between quake and hebgan. The rainbows are moving up out of quake lake and stacking up below hebgan dam, but it's no big secret. You will have ... morecompany. 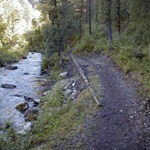 It seems to be a race to the first soft water below hebgan. It's a great hole full of fish but angler density is a little to high for me. Down closer to quake lake there are a couple of small channels on the other side of the river that are chalk full of rainbows, if your a strong enough wader to cross the main river. Due to high snow pack they have already started raising flows. As of yesterday it was up to 1400. Which is high for this time of year. Wading caution is called for. As far as flies. Spaghetti and meat balls "San Juan worm and an egg ball". Have been the best. Although you can still find the bigger fish on a black biggest. Over all fishin is good just expect company. Early lowland run off in April caused the big hole to jump from around 450 cfs to just over 2000. This pre runoff really kickstarted the fish. The fish turned on as soon as it started ... moreto fall. it has now stablized around 1500 and fishing remains good on both dries and wets. There are still a few squalla bugs around so a size 8 chubby chernoble has been a good one especially with a San Juan worm hanging hanging about 2 ft below it if there is a little cloud cover, you can expect a good hatch of march browns by about 1:00. If the march brown do show up look for risers. 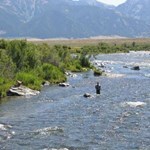 There are only 400 fish per mile on the Jeff as compared with over 2000 for the Madison. Look for the fish there not everywhere. If you can get a few clouds, streamer fishing stays pretty good all day but the big show is the march browns in the afternoon . Due to wild-run rivers flooding over, the White River’s catchment dams are on the rise which means we should be prepared for higher discharges. Overall, things have been steady around ... more3000 cfs, but we could see higher levels with the lake continuing to rise above power pool. This may not be the best news for wade fishermen, but it’s good for float trips. The caddis hatch is strong this season. 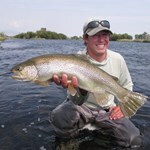 Right before the last rain we had success with dries such as Elk Hair Caddis and CDC Caddis. We can expect continued success as long as the caddis hatch continues. 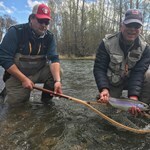 Water flows from Palisades Dam have dropped this week (18,000 to 14,000 cfs) and even though the South Fork is still running slightly off color, the fishing has improved quite a bit. 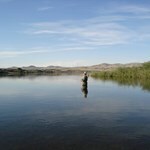 ... moreThe upper reach in Swan Valley and the upper Canyon from Conant to the confluence with Burns Creek have seen the best fishing. Targeting riffles, eddies, seams and banks with double nymphs has been effective. BWOs have also been making an appearing in large numbers, and using mayfly nymph imitations works well. But large stonefly imitations and mysis imitations are also just as effective if not better on some days. We’ve had decent weather this week with temps in the 50s and warming into the 60s. Water temperatures have been reaching the upper 40s on the Lower Snake River below Moose Bridge. ... moreWe are also starting to see the first skwalas of the season, which makes it possible to fish with large attractors along banks, seams, inside turns of riffles, and the current margin of riffle pools. BWO imitations are also doing well most days in riffles and riffle pools along seams. The afternoon is the best time for these flies. As far as nymphing goes, use either a double nymph rig or a dry/dropper rig. Large stonefly imitations and small mayfly and caddis imitations are working well. Aim for riffles, banks, bankside troughs, seams and confluence lines. On good days, streamers are really effective, but overall the consistency is low. We’ve been finding success with intermediate sinking tips, 3ips and 6ips tips, and 5 to 7 feet of T-11. The best places for streamer action have been banks and structure, riffle and riffle pools, and seams. Moderate sized baitfish imitations and bigger, articulated streamers are effective. High water flows right now. The Lower and Upper Canyons are flowing from bank to bank. 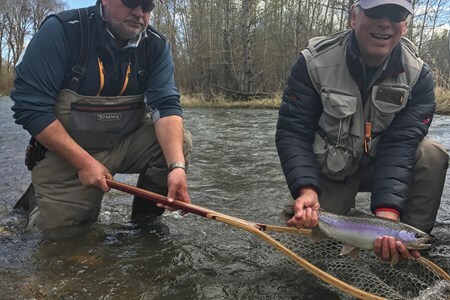 The best fishing currently is out of the Farmlands or Upper Proper, which both offer access on ... morefoot in high water using islands and channels. 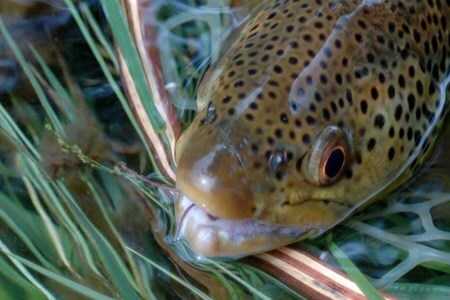 We are currently experiencing hatches of March Browns and Baetis, along with the Skwala hatch. 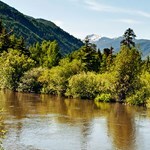 Just around the corner we'll be seeing Salmonflies and American Grannom - Caddis. Water levels are still high, but not enough to scare off anglers. While not necessarily ideal conditions, the fishing is still pretty good. 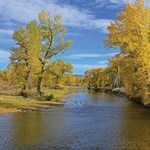 The river is down 100 cfs to 400 (normally ... morearound this time of year it’s in the 90-150 range). A lot is coming from the Little Deschutes. 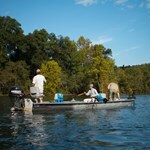 Once the runoff winds down, fishing should be excellent. We’ve had success on the river with Jigs and Micro Mayfly Nymphs. 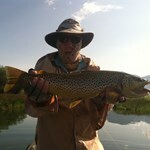 Also heard someone caught a decent sized brown with a sculpin over near Tumalo. High angler traffic in the Lower Bridge area due to reports of strong March Brown hatches along with Grey Caddis, Midges, and some Blue Winged Olives. Spring fly fishing season on the Madison has officially arrived. We have already started leading some guided fishing trips and the ice pack is long gone. 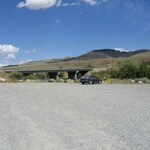 The weather is warming up ... morea bit, and overall is nice. 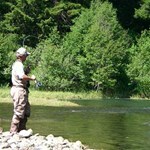 Currently, slow nymphing and streamer fishing are getting good activity. Blue Winged Olives should also get some action later in the day. The Madison is living up to its spring potential. It’s also really nice having the entire stretch from Reynolds Pass to Ennis lake open right now—anglers are finding more room to spread out along the river. Looking forward to the summer, we should see great water conditions on all our rivers, fewer closures, and less crowding on the Madison due to the great snowpack. All of the major drainages in the area are at or above average snowpack levels. 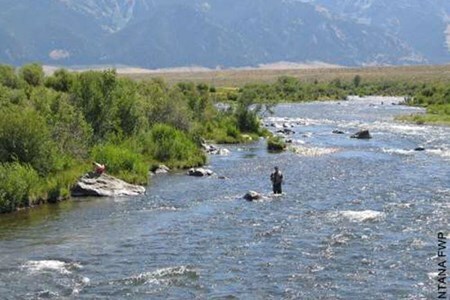 This is good news for surrounding streams, where anglers will be able to find their own space instead of clogging up the Madison. On some years with low water (i.e. 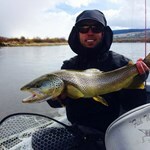 the last several years), the Madison becomes the only spot with really good fishing in Southwest Montana. 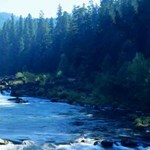 That’s because of the cool water coming from Hebgen dam and the fast-moving oxygenated water of the Madison. 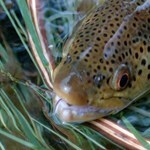 This should turn out to be a great year with plenty of options for fly anglers to choose from! We’ll have to wait and see how bad the runoff is this year, and that will all depend on the weather. 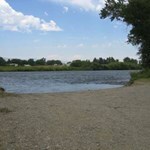 With temperatures in the 80s for extended periods of time (around late May or early June), the river will become jammed with dirt and the runoff will be extreme, but short. 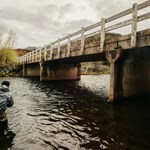 On the other hand, if things start slow with a mix of warm and cool days, it could mean mildly clear water and fishable conditions all through the runoff. No matter what, we can always find a great place to fish, it might just mean we have to spend more time in the car! Spring has sprung and the Blue Winged Olive hatches have begun. Here in Park City, both the middle and lower sections of the Provo River are seeing some nice activity. Though we haven’t ... moreseen any “blanket” hatches yet, we have still seen enough bugs to keep the fish active. 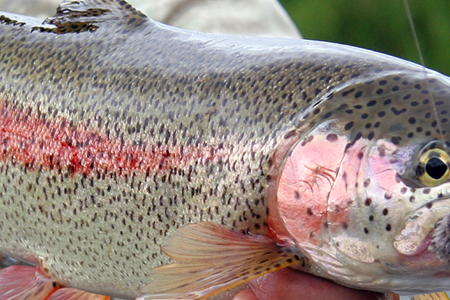 Clouds, cool weather and rain will likely produce a decent hatch. Look for stormy weather if you want to experience this. Also, most hatches are occurring in the late afternoon (try 1-4pm as your target window—later is better). We have found that patience is important, and you should be willing to try various different flies on the BWO lifecycle. If you’re not having any luck with mayflies, we suggest you switch to nymphing when the action is sparse up on the surface. Also be sure to pack cripples and emergers for when the hatch is approaching. BWO nymphs live in fast moving water and they are great swimmers. When they emerge, they swim straight to the surface and get pushed into slower pools and flats. You may have to explore the river a little bit to find these spots that are perfect for BWO behavior. Look for deep pools, riffles and flats, and don’t be afraid to move around! This is one of our favorite hatches, and there are a number of reasons why. BWOs mark the beginning of the river coming back to life after the long, dormant winter. 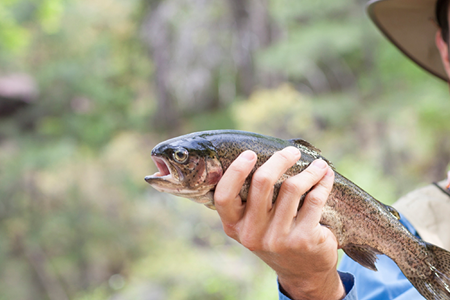 They also bring out aggressive feeding tendencies in trout, so the strikes are good. 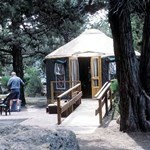 Additionally, the weather is great, and we get to enjoy the wonderful restoration that Spring brings! 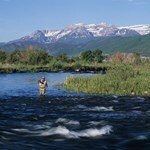 We hope you have a great start to your Provo River fly fishing season!